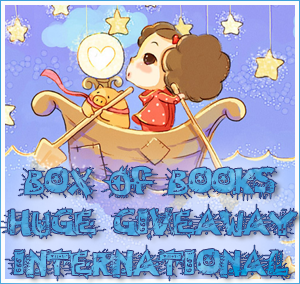 Bookish Lifestyle: BOX of BOOKS - Huge INTERNATIONAL Giveaway! BOX of BOOKS - Huge INTERNATIONAL Giveaway! I present you with a huge INTERNATIONAL giveaway: 16 books! Mostly ARCs, but not only! Water Wars and The Last Archangel are finished copies! Damned has a signed booklet! Razorland is actually an ARC of Ann Aguirre's Enclave! All of the books here are awesome and I'm sure you'll love them! Wow! What an awesome giveaway. So many awesome books. Wow, that is a most generous giveaway! My favorite read of this year so far has been Dust and Decay! I love Jonathan Maberry! Thank you for the giveaway. Can never have to many books. I recently read Love story!!! Oh I forgot. Some of my favorite reads this year were Descended by Blood, Pyxis, Half-Blood, Exiled, Obsidian, And Clockwork Prince. There are so many good books I read this year besides those though. Wow! An awesome haul to the winner!! OMG that's a crazy amount of (AMAZING) books!! Blood Red Road, A Game of Thrones, The Sky is Everywhere. Oooh! Hard question because there are so many! Um...Starcrossed by Josephine Angelini, Half-blood by Jennifer L. Armentrout, The Goddess Tests Aimee Carter, Iron Fey series by Julie Kagawa, Mara dyer, by Michelle Hodkin, Delirium by Lauren Oliver, Die for me by Amy Plum, Hourglass by Myra McEntire, TMI and Infernal Devices by Cassandra Clare...I could go on and on. THERE ARE SO MANY! LOL. The Night Circus, The Scorpio Races and Clockwork Prince! Hmm... maybe Anna Dressed in Blood, Destined by P.C. Cast, and Divergent!! Thanks so much for the giveaway! You're so generous! The Night Circus was amazing. Loved it, Thanks for having this giveaway. My favorite reads for the year were Delirium by: Lauren Oliver and Forbidden by: Tabitha Suzuma. I have recently started loving the dystopian genre and Delirium has been my favorite so far. Forbidden made me bawl and cry way more than any other book has ever done, it was so emotional and amazing to read. Oh my goodness--are you SERIOUS? THis giveaway is EPIC AMAZING. My fave reas this year: Across The Universe, Shatter Me, and Touch Of Power by Maria V. Snyder. I ADORE Maria V. Snyder!! My favorite reads this year? I also loved The Succubus series by Richelle Mead and Wither, The Faerie Ring by Kiki Hamilton, The Agency books by Y.S. Lee, I could go on! Thanks for the giveaway! I loved so many books that came out this year including Fateful by Claudia Grey & Divergent by Veronica Roth! Wow, I saw that AUDITION book in there and immediately wanted to enter! I'm reading BECAUSE I AM FURNITURE right now and really enjoying it. Also, I discovered FIXING DELILAH and am in love. So many books, so little time. Thanks for the giveaway! And I don't live too far from you ... I'm in SC Washington State and I grew up in Hong Kong and lived in China for 8 years, so I think we have our international interest in common, too! Nice to meet you! Can't you just give me Fever and then everyone else the rest? 15 books still sounds impressive in a giveaway. No? Really? I've got Fever fever! Fine, so I'll just run along with everyone else. My favorite reads... I'm going to say Delirium. Still gives me chills "I love you. Remember. They can not take it"
Thanks for the giveaway! So far I loved Delirium and the entire Iron Fey series! My favorite reads this year were Daughter of Smoke and Bone, Demonglass and The Wise Man's Fear! Wow! Whoever wins is a lucky son of a gun! Thank you so much for this giveaway! My favorite read this year has been Beth Revis' Across the Universe. Hmm my favorite reads this year were Divergent, Shatter Me, and grudgingly Clockwork Prince. Happy Holidays & thanks for an incredible giveaway! Good luck with the move!! Wow! Awesome giveaway! My fave read this year was either The Forest of Hands and Teeth trilogy or The Help. Thanks for the giveaway! My favorite reads this year were Half- Blood by Jennifer l. Armentrout, and others. OMG, I'd die if I won this!! Great giveaway! Thanks! The Scorpio Races, The Night Circus, Daughter of Smoke and Bone, Unwind, Divergent, Shatter Me. I'm sure I'm leaving heaps out. It was a great year for books. Thanks for the giveaway! My fav read this year was definitely DIVERGENT, but I also really enjoyed PARANORMALCY and SUPERNATURALLY by Kiersten White. Sweet Giveaway!! :D Favorite reads? Hmm, Red Glove and Nevermore certainly were in the top ten! That and Divergent for sure!! The Unbecoming of Mara Dyer by Michelle Hodkin. So kind of you :D Thank you for this wonderful giveaway! My favorites this year were the Book thief, Across the Universe, Lola and the Boy Next Door, and White Cat. So many awesome reads, but The Unbecoming of Mara Dyer. What an epicly legendary giveaway! Thanks for the giveaway! I really enjoyed Stone Cold Seduction by Jess Macallan, Unleashed by Sara Humphreys, the Changeling series by Dani Harper, Claimed by Rebecca Zanetti, and of course Drink Deep by Chloe Neill. So many great books this is a great giveaway. My favorite reads of the year were Clockwork Prince & City of Fallen Angels by Cassandra Clare, Last Breath by Rachel Caine, Switched by Amanda Hocking, and lots more. Thanks for this giveaway! My favourite reads of the year were Imaginary Girls, The Night Circus, and The Daughter Of Smoke And Bone. The Scorpio Races by Maggie Stiefvater is my favorite of the year. Amazing premise upheld by evocative writing. Amazing giveaway Evie!!! Soo generous good luck to everyone! Wonderful giveaway. My favorite reads of the year (so far) were The Night Circus, Fire by Kristen Cashore, Pure by Julianna Baggott, A Storm of Swords, Unearthly, and so many more. good gracious Evie! this is incredible! so generous. moving, wow. i can't even imagine packing to move! this year, i have LOVED reading The Night Circus by Erin Morgenstern, Incarnate by Jodi Meadows, Daughter of Smoke & Bone by Laini Taylor, Pure by Julianna Baggott, and Destined by Jessie Harrell. i'm sure there are others, but those are some of my absolute favorites!!! don't know if i should've given my whole name instead of just the facebook part, but the Facebook has it. my favorite reads of this year are The Lost Hero and The Throne of Fire by Rick Riordan. that's it. there's not much favorites i've read that were books coming out this year. mostly i read books that came out the years before 2011. Such a wonderful giveaway! My favorite read(s) this year had to be Divergent, Wither, Shatter Me, and Saving June! Awesome giveaway! My favorite reads this year so far is The Colonial's Lady, Courting Morrow Little, Nevermore and Entwined. Ummmmm wow! What an amazing set of books to win! THank you so much for giving away this many books to one person. Wow, what a great giveaway. Lots of great books in that pile. I really want the Fury and Bloodlines books. Thanks for the chance to win. Amazing giveaway first of all. My favorite books this year have to be Anna dressed in blood, anna and the french kiss, the hunger games series and all of cassandra clare books. Too many more to mention but ah what a great book year it was. Oops I forgot to list my fav read for this year. Anna and Lola were both amazing, but so was Obsidian, Wolfsbane, Wildefire, all books by Gail Carriger, and so many others! Amazing giveaway! There are so many books in there that I want to read! oops, forgot fav reads. Violets of March by Sarah Jio, Second Chances by Lauren Dane, Hit List by Laurell K Hamilton, Black Dagger Brotherhood books 1-5 by JR Ward, and Just Like Heaven by Julia Quinn. Just to name a few. My favorite read of this year has got to be either Unearthly by Cynthia Hand or The Night Circus by Erin Morgenstern. Both awesome books! My favorite books this year were the last ones from the BDB by JR Ward (Lover Unleashed) and Midnight series by Lara Adrian (Deeper than MIdnight), as well as Bloodlines by Richelle Mead. Thans for this awesome giveaway! Wow, you are so much better than I am. I can't stand to part with my books. My favorite reads of 2011...hmmm, probably The Fever Series by Karen Marie Moning or The Shade Series by Jeri Ready-Smith. Hard choice. Great giveaway Evie! Can't wait to have you closer. This is such a hard question... some of the best reads I've had this year have been Legend by Marie Lu and The Art of Fielding by Chad Harbach... bit there are so many more books that I loved. Sarah's Key, The Graveyard Book, Please Look After Mom are some of my favorite books this year. However they were published few years ago. amazing giveaway amazing book! i would love to win! thanks for this giveaway! <3 I loved Remembrance by Michelle Madow. It was such a god book. some of my favorites this year were Divergent, Where She Went, Forever, and the Unbecoming of Mara Dyer. And even though it came out last year, I didn't get to read it until this year, but Anna and the French Kiss was up there too. Oh wow, my favorite reads this year are Legend by Marie Lu, Anna Dressed in Blood and Divergent! This is an awesome giveaway, wow! I've read a lot of books this year but a couple of the newer ones that I enjoyed were All Wounds by Dina James and Bedeviled by Sable Grace. My favorite of the year was Exit the Actress by Priya Parmar. The Night Circus, Iron Knight and lots more! Hmm my favorite book this year has to be Wither by Lauren Destefano. Awesome book! Had me from the first page. Reading Dearly Departed now and would kill to get my hands on razor land! I enjoyed City of Fallen Angels. Wow AWESOME giveaway!! I've been wanting to read several of those titles!! **keeps fingers crossed** some of my favorites that I've reviewed so far are Tempest by Julie Cross (will be release in mid Jan.), The Wizard Heir by Cinda Williams Chima, Candlewax by C. Sims Bailey, Farsighted by Emlyn Chand, and Fractured Light by Rachel McClellan. and i'm jaclynsmusings on gfc it didn't let me type it in anywhere. What a fabulous giveaway, thanks so much for thinking of us. I forgot to mention some of my favorite reads of 2011. I loved Kevin Hearne's Iron Druid series, Faith Hunter's Jane Yellowrock series, Jennifer Estep's latest Elemental Assassin books, Tangled Threads and Spider's Revenge, and Cherie Priest's Bloodshot. Favourite reads...gosh. All These Thing I've Done was one I really enjoyed. I'm also about to read If I Die which I think I'm going to like, I can't wait! Oh my dear! such a huge and amazing giveaway!! thank you soooo much!!! so many awesome titles! you rocks dear!! =D thank you! I honestly dont have just one favorite!!! But Im in love with anything Jennifer L. Armentrout writes so I have to say Half blood!!! Thanks for the giveaway! Anita Blake series Books 1-6 by L K Hamilton. Although, quite sadly I own up to book 16... but I've lost interest with the rest of the series. *sigh* I've tried numerous times!! J.R. Ward BDB series. I so adore! I'm so stopping there. I could go on and on. My favorite reads of the year was anything by Richelle Mead. I read 3 of her series. Thanks for inviting me to another cool giveaway! This is the coolest giveaway ever! You're so generous. Thank you so much! I loved Scorpio races and Forever and Wildcat Fireflies...and wow too many to write down! Fantastic giveaway. I love Bloodlines and Fury. I still haven't got my hands on those. And Derek Landy's Skulduggery Pleasant is just plain awesome! I loved Supernaturally and Delirium and Divergent and The Iron Knight and Bloodlines... there are just too many books to name all of them!! My favourite read so far has to be the Hunger Games. I waited way to long to read them. This is such a generous giveaway. I finally read the Hunger Games this year (last month actually) and it is an amazing book! I also liked Wither a whole lot too. Thanks again! OMG ! Thank you SO much for this amazing giveaway ! I loved Delirium, Hunger Games, Divergent, If I Die, Nightshade, Before I Fall, and Unearthly. Cool giveaway! I loved Fifty Shades books, I also loved Exiled and Love is Darkness. Thanks for the amazing giveaway!! My favorite read was Clockwork Prince. It was fantastic! Favo book this year was an oldie. Wind in the Willows. Great giveaway my favourite books that I read this year are The Mortal Instruments series and The Hunger Games. Thank you so much for this giveaway! My favorite reads of the last year were Lola and the Boy Next Door and Delirium. My favourite read would have to be What Happened to Goodbye by Sarah Dessen. My favorites books this year are Daughter of Smoke and Bones by Laini Taylor and Divergent by Veronica Roth. So many books! And its international. You don't see that every day! Thank you for your generosity!! Oh right. My favourite reads? There are plenty more I just can't think of them all atm. Fav ... Probably Bloodlines or bound by C.K. Bryant. This year has been awesome for me book wise. There was The Hunger Games trilogy, Cinder by Marissa Meyer, Divergent by Veronica Roth and a few others. OMG!!! This giveaway is Insane!!! WOW!! There are so many books I read this year...I got hooked onto historicals this year so I'm immersing myself thoroughly into historicals. Julia Quinn, Lynsay Sands and Julie Garwood are my fave historical writers. I also started Night Huntress this year and omg! I love it!! I'm loving the amazing giveaway. I've had many great reads just some from this year are The Cleaner by Paul Cleave, Everneath by Bradi Ashton, Garden of Eden by M. Nova. Yay to yourself moving ;-) ! But seriously, thanks for this great idea and generosity! One of my fav reads were definitely The Hunger Games books! Really a huge giveaway ! Not often such a giveaway is open worldwide so thank you very, very much. I have read so many good books this year that it is very hard to choose only one but the one that has stuck in my mind was The Book Thief. wow 16 books? That's amazing. Thank you for this giveaway! My favourite book from 2011 is easy...without a doubt it's Edinburgh Dead by Brian Ruckley. LOVED it! Thank you! But favorite reads this YEAR?! Way too difficult to even think about right now. My favorite read for this month has been The Probability of Miracles by Wendy Wunder. One of my favorite reads of the year is The Stillburrow Crush by Linda Kage. Oh my gosh, thanks so much for this AMAZING giveaway, Evie!! :) I have so many favorites from this year that it's hard to choose only a few, but among them are Wither, Clockwork Prince, Unearthly, and Bloodlines! Sooo many books were great this year, but I think my favorite is Divergent. This is an awesome giveaway! Thanks for it! My favorite reads include: DIVERGENT, THE HUNGER GAMES, WITHER & GARDEN OF EDEN. I forgot to tell about my favorite read this year, my bad. Some of my fave reads this year are Finnikin of the Rock and Daughter of Smokes and Bones. fav reads would be discovering new authors. as i avg 30+ books a month there are way too many to list. i read most everything now that i have some vision back. My favorite this year was Death in The City of Light and The Help. My favorite book was Divergent by Veronica Roth and the Iron Fey series. Amazing giveaway and thank you! What a great giveaway Evie! Thanks for the opportunity and good luck with your move! My favourite read of the year was Divergent. I can't wait for #2! It was such an amazing year for YA. Although this book didn't come out in 2011, it was definitely my favorite read of the year: Thirteen Reasons Why by Jay Asher. I really liked Die For Me by Amy Plum too! Awesome giveaway! Thanks for sharing the goods! Daughter of Smoke & Bone by Laini Taylor is one of my favourites, together with the Black Dagger Brotherhood series by J.R. Ward! Wow so many awesome books! Thanks for the giveaway! OK. let's try this again. Thanks for the giveaway. My favorite reads this year has to be the Psy-changeling series and the Fever series. My favourite read of the year...well if we're going only by already published books I'm going to have to say The Mysterious History of Frankie Landau-Banks by E. Lockhart because that just made me so happy, though Anna and the French Kiss by Stephanie Perkins is definitely a close second and Maureen Johnson's The Name of the Star not far behind. Some of my favourite reads this year are: Ready Player One by Ernest Cline, The Restorer by Amanda Stevens, Leviathan Wakes by James S. A. Corey, Dust & Decay by Jonathan Maberry, A World Without Heroes by Brandon Mull, Ember and Ash by Pamela Freeman, etc. Thanks for the amazing giveaway! Really generous! Thanks for the giveaway! A few of my favorite books (that I've read this year) include Lying Season, Highland Blessing, Stuck in the Middle, Girl with a Pearl Earring, Next Door Savior, Money and Marriage, etc. I finally got to The Hunger Games series earlier this year and devoured those. It's probably a toss up between those and the Locke & Key graphic novels. Both very creepy and fascinating series. What a massive giveaway! Thanks very much! Some of my favorite books this year are The Son of Neptune, Bloodlines, and Drink Deep. My GFC name is Dovile. My favorite reads this year were Anna Dressed in Blood, So Yesterday by Scott Westerfeld and How to Seduce a Naked Werewolf by Molly Harper. ...need I go on? Seriously, it's been a GREAT year reading wise. Food for my bookish soul. THanks again...best of luck on the move...and happy reading! Thank you very much for this imazing giveaway. Hope I win. One of my favourite writers for this years is Scott Westerfeld and Richelle Mead. Thank you so much for making it international! GFC TGHicks! Thanks for the giveaway! Thanks for the giveaway! That is truly generous of you! my favourite books of 2011 is...I think oh, Good Omens, totaly! (jop I am a looser and read it this year) eh ome book from 2011 and not from 1996 :)): The Lost Stories from John Flanagan, Entangled from Cat Clarke, Witch Eyes from Scott Tracey and Bloodlines from richelle Mead. This is an amazing giveaway! OMG!! My favourite books of 2011?? Well, that's not easy... Recently I enjoyed Princesa (Princess) by Patricia Sutherland and Te esperaré toda mi vida (I'll wait for you all my life) by Megan Maxwell. *dies* omg omg omg! I've never been so excited about a giveaway! This has ALLL the ARCs I've been dying to get my hands on, but wasn't able to since they had already all been given out or were not being handed out to Canada! Thank you so much for this amazing opportunity! Sorry I commented before I went to the Rafflecopter. But my favorite reads were mainly zombie fic. ;) Enclave, The First Days...it's me latest obsession. I read "This is Gonna Hurt" by Nikki Sixx and I really liked it. I also read "The Dirt" by Motley Crue. I also really loved the Fever series by Karen Marie Moning. I loved reading A Discovery of Witches! It's my favorite book at the moment and it really was a great discovery when I bought it. Thanks for hosting this - it's awesome! thank you very much for a fabulous giveaway, Evie!!! This is amazing :o WOw!! Wow! what a generous giveaway. I'm a book nerd, so I'll happily take these off your hands and out of anyone else's should I win!!! Oh, please PICK ME!!!!! Aaaaaaahhhhhh!!!!!! Wow this giveaway is awesome thank you so much. I have so many favorites but you asked for it lol. I'm sure there is more I just can't think of them lol. Oh and my GFC name is Caitlin Audet. Forgot that part sorry.